When I first heard that A Series of Unfortunate Events was to be turned into a Netflix series I was ecstatic— a word that here means jumping on the furniture with glee. The books and the very good film which came out in 2004 were a fundamental part of my childhood, so much so that in the writing of this article I am choosing to pay homage to Mr Lemony Snicket by emulating the authors style— pay homage here means copy, but in a flattering if a little conceited manner. Since taking up this approach I realise that my own writing style seems to have been formed by this early childhood love. A Series of Unfortunate Events implores you to not watch the woeful tale of the young Baudelaire orphans: Clause, Violet and Sunny. From the opening credits, we are told to ‘Look away, look away’. This dark humour runs deeply throughout the series and sets a fabulous gothic tone. The sarcastic, slapstick, deadpan and self-deprecating humour is by far the strongest point of the series, which is fortunate because the plot will be familiar to Snicket fans. The original film of the same name has a very similar aesthetics and recounted the first three books of the series, of course with some embellishments— a phrase that here means adding train related death scenes. As the long form series follows the same three stories to begin with you may, like myself, feel a sense of encroaching déjà vu as the plot unfolds, of course with some embellishments— a phrase which here means the surprise introduction of movie expeditions and Will Arnett’s character of Father. However, as we are given new details, and a new story in the final two episodes, this can be forgiven. 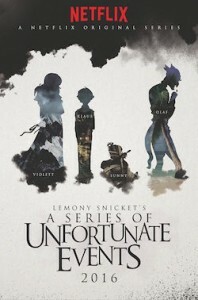 The series is not so much about the plot, I would argue, but about exploring Lemony Snicket’s rich and mysterious world. The man behind the pseudonym of Lemony Snicket, Daniel Handler, co-produced, wrote and adapted this series for television, which will make this world feel very authentic to the fans. I will begin now to recount the sad and troubling tale of the Baudelaire orphans in as brief a manner as possible; to stop the dear reader of this article’s eyes from welling up too greatly with tears. Klaus (Louis Hynes), a lover of books; Violet (Malina Weissman), a lover of invention; and Sunny (Presley Smith), an infant whose love is biting things; have become orphans and are placed into the care of Count Olaf (Neil Patrick Harris), a villainous man with terrible acting skills who seeks only to acquire the siblings’ vast fortune. The tale continues as they move through a procession of guardians whilst the orphans attempt to escape from the wily actor’s clutches. Also sad and troubling is the fact that there is a serious gender imbalance within the cast and crew of the series in favour of men. As well, there are many jibes at older women in the series: Joan Cusack is given the role of struggling actress in middle age, and many of the older women at times openly regret being successful in their occupations but never having time to have a child. Despite these flaws, the series does celebrate accomplished women. This is shown most fervently through the character of Violet. Violet loves all things gadgetry, and alongside the bond she holds with her siblings her skills in invention are often what saves the day when events seem most dire. There is a fabulous moment where Violet picks a lock and is then told, ‘nice girls shouldn’t know how to do that sort of thing’. Of course, if Violet was a “nice girl” how could she fight off carnivorous leeches, help decode secret messages, and put an end to a downright creepy underage marriage between herself and her supposed uncle? Because of the overall tone of the series, ideas of family are regularly sarcastically broken down and dismantled— a word which here means undercut by the lack of success any family unit has in this series (aside from the close family team the siblings hold amongst themselves). What it is to be a family is therefore constantly being reinterpreted by the orphans who, as the series’ smartest characters begin to see the strengths in constant revaluation. The viewer is asked who could watch a series with so much death and darkness. My answer would be pretty much anyone, as this show may be dark but the humour brightens it and there are numerous darker examples of shows on television. But even so I’m not entirely sure who this series is for, what with the children who read this series originally having grown up— a term which here means having now accumulated vast university debts. This series will need to gain traction with its new target audience who are the next generation— a term which here means woke teens who don’t watch television on an actual television. As a young person, I loved thinking about the mysteries presented in these books and learning new words and self-referential writing techniques (nerd). The books explained to me what a red herring was and what literally meant, and I think today’s teens and tweens will enjoy this as well because they present themselves as a very clever generation. This series is clever and gains a lot of momentum, so stick with it and enjoy the misfortune of others. At first I worried that this series had the wit and look of the original book series but not the heart. Thankfully the more I watched the more I realised I was mistaken as A Series of Unfortunate Events has heart in spades— to have in spades meaning to have in vast amounts, for example this article has spades of em dashes. Overall this series is like having been in a bath for a while and then adding more hot water and then seeing a puppy— which is perhaps too pleasant a simile to end on, but I’m no Lemony Snicket… or am I. This entry was posted in Film, TV and tagged tv. Bookmark the permalink.